Great to work so closely with Prof Esther Charlesworth and her team to assist the first batch of the RMIT Master of Disaster, Design and Development (MoDDD) students with a field trip to Marysville. The township was significantly impacted by the 2009 Victorian bushfires and the experience of community members, businesses, local government and practitioners still provide a rich insight into the complex nature of recovery from disaster. 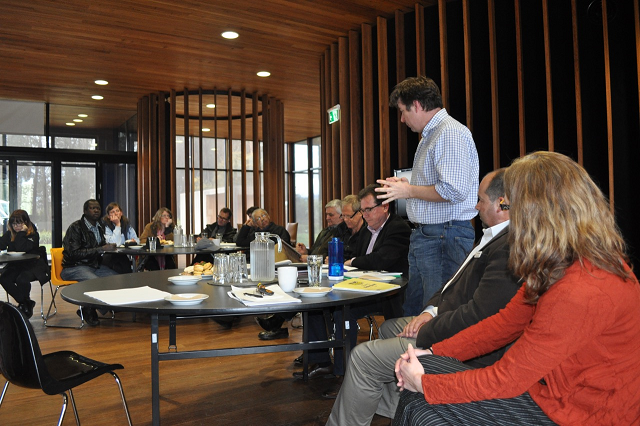 The group also heard from Prof Ed Blakely and the Victorian Government Department of Health and Human Services. CDMPS was able to ensure that community, practitioners, and government were able to engage in discussion with the students about the good and the bad of recovery to better inform them at the start of their career in disaster management. Thanks so much to community leaders and local government staff for their support of this initiative.